To provide and promote leisure, recreational and cultural activities for all citizens. To provide and promote leisure, recreational and cultural activities for all citizens. This is accomplished through professional staff who provides recreational programs, events and activities and who maintain facility standards making them aesthetic and desirable for use. We strive to have our local parks are a source of pride for our Community. Through our services, we aim to enhance personal well being and to improve the quality of life that makes Medical Lake a wonderful place to live, work and play. The City of Medical Lake Parks & Recreation Department is always in need of volunteers willing to coach our youth sports leagues. Without volunteers, teams are left ready but without a coach. We need your help! We rely on parent volunteers to coach our youth sports teams. With your help we can offer a higher quality of programs for our kids. Please consider coaching your child’s team. 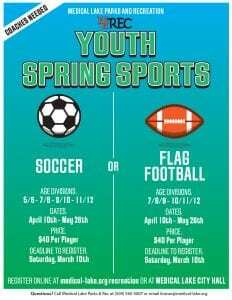 Spokane Youth Sports at 536-1800. Seniors who are behind the wheel are at high risk for accidents and injuries compared to younger counterparts. Degrading vision, poorer cognitive function, side effects of medication and slower reaction/response times mainly account for collisions and mishaps. About 10% of Medical Lake’s population are seniors and an estimated 24% live alone. Among older adults who are homeowners, over 91% have access to vehicles. Protecting the elderly when driving and other road users is important to keep everyone safe. To start off, the elderly must drive a car that is not only technically and mechanically safe, but also adapted to the needs of seniors. Smart features such as ergonomic seat belts, large mirrors, auto-dimming mirrors, automatic wipers and so on help seniors improve visibility while on the road. Learning where airbags are located and steering wheel tilt are vital in the event of a crash. You can also take a refresher course to ensure that your driving skills are on par and to find out about the latest in safety technology. This articles describes additional tips on senior driving.